The Manchester Writing School at Manchester Met and the International Anthony Burgess Foundation are delighted to present an evening with Rachel Lichtenstein and Gregory Norminton. This special event welcomes Rachel to the School as our first Reader in Place Writing, and launches Gregory’s new novel, The Devil’s Highway, a celebration of and elegy for the place where he grew up. Rachel and Gregory are both ‘place writers’, Rachel in non-fiction and Gregory in fiction. They will be talking about the challenges of place writing, of research and how to think one’s way into the physical and mental realities of yesteryear. Where do their seemingly different disciplines meet and where do they part company? Rachel will introduce her practice as writer and artist, and Gregory will read from his new novel. Rachel Lichtenstein is a writer, artist and activist. 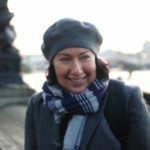 She is the author of five books, including Estuary: Out of London to the Sea (2016), On Brick Lane (2007) and, with Iain Sinclair, Rodinsky’s Room (1999). She is Manchester Writing School’s new Reader in Place Writing. Gregory Norminton is a Senior Lecturer in Creative Writing at the Manchester Writing School. He has published seven works of fiction, most recently The Devil’s Highway (4th Estate, 2018), which has been described by Robert Macfarlane as “a brilliant deep-time meditation on how landscapes hold – and conceal – meanings”, and by George Monbiot as “a powerful, essential novel… the best treatment of climate change in fiction I’ve come across”. Manchester Writing is a series which explores the techniques authors use and choices they make when writing, and debate issues arising from their work. Drinks will be available to purchase from the bar and copies of the authors’ books will be available from Blackwell’s bookstall, with signing after the event.